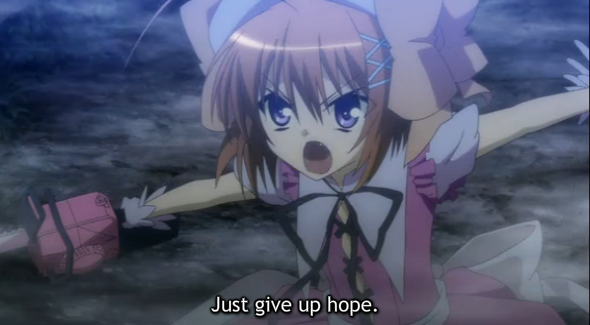 Another harem, zombie, romance, ninja, pop-idol, vampire, magical girl, school life, murder mystery? This post covers Kore wa Zombie desu ka? (“This is a zombie, huh?” hearafter, Zombie? ), an example of the Genre Mash-up genre. Every season brings at least one series that features a mocking self-referential appropriation of conventions. I’ll return to conventions and the notion of genre after the jump. I also look at Zombie? as an example of the Genre Mash-up genre, and conclude with the question of whether someone would enjoy watching it (summary: while not great, it has enjoyable moments). Charm point: over sized bows on beret. Let me start by unpacking the term “convention” a bit. There are many terms with related meaning, for example “trope”, which comes from literary analysis, or “lick”, which is sometimes used amongst musicians to describe not only a specific melodic concept, but also an indicator of genre, such as “country lick” or “blues lick”. In anime, there are many different types of conventions, such as conventions of character, setting, event, as well as conventions specifically supported by the moving picture medium. A well known example of the latter is the “transformation sequence”; we might call it a “magical girl lick”, because when the animation producer uses it, they are signaling for the audience to think of the magical girl genre. There is a special genre that operates by appropriating conventions from different genres and mashing them together. Often this can be a vehicle for parody, or at least comedy. Melancholy of Haruhi Suzumiya (season 1) showed that this sort of genre mash-up could produce more than an aggregation of otaku bait. Who is Yuu? 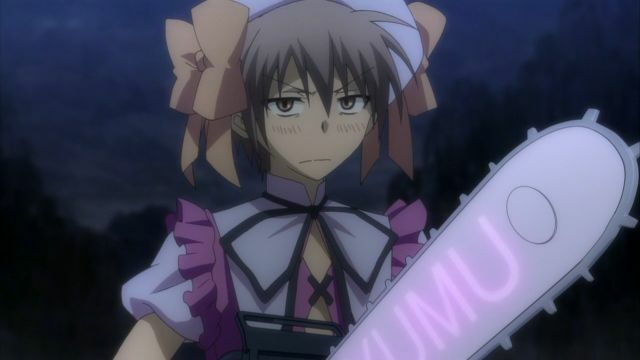 Guess which character stars in Kore wa Zombie desu ka. Hint: She hardly ever talks, and she has grey hair. It is easy to imagine this genre mash-up genre handled poorly, but it has some strengths. For example, the use of character types and standard plot devices has long been used in dramatic traditions (see for example, the Commedia dell’ arte), where the “stock elements” freed the actors up to improvise (offering fresh interpretations of well-known types). In anime, use of these well known character types sets up expectations that can be used (whether by reinforcement, or by contradiction) to give an alternate life to a character. Note that this is not merely ripping off a character and inserting it into a new show. The impact depends on the viewer being able to make the connection in order to generate the expectations. Haruna, ultra-director ...errr, I mean, super-genius, Masou Shoujo. So, does Zombie? deliver more than the collection of its parts? I would say it does. At times the show is very clever, this is apparent in the very first episode when the show’s take on magical girls is revealed. Also, some of the characters were well handled. In particular, Haruna (kind of a combination of Haruhi Suzumiya and Cardcaptor Sakura) had some depth to her portrayal, and this offered a compelling alternate life to her character type predecessors. Unfortunately the overall storyline falls apart, so the show does not live up to its evident potential. If you like the sound of the Genre Mash-up genre, by all means give this show a chance, but be prepared for a disappointing second half, that wavers between being overly serious and not quite taking itself serious enough. Good post! 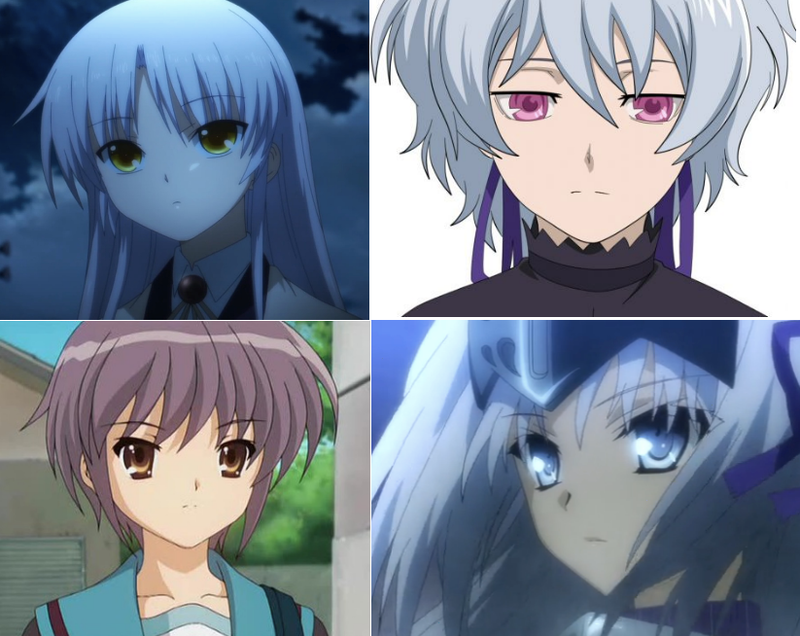 True Kore wa Zombie might not be 100% original thanks to the usual suspects such as the grey haired silent girl, which is seen in lots of anime. And the story might not be anything amazing, but I enjoyed the random comedy and characters especially Haruna. They did give her a fun story and a bit of drama thrown in, especially near the end she gets really attached to Aikawa. Overall this was a fun show, there wasn’t really to much this winter that amazed me compared to Zombie and Merry. But most people will drop this series if they are not into random comedy with little to no drama between characters. Well, anyone that has a hard time enjoying the humor at the outset of this show should bail right away, because by the end, it becomes almost entirely gag-based. I actually thought they played the serial murderer arc well. On the other hand, I like penguins, too. Yeah, this was one of those series that had enough great ideas that it was a bit of a shame when it doesn’t deliver a complete package. I would be willing to look at another show by the same creative team, to see if they did a better job. Zombie was by no means a train wreck; it just used up all of it’s best material, then stuck around too long. Great scoop. Actually, the protagonist is not what we can called a zombie. He is more to immortal being. His body not rotten at all to be called a zombie although he is undead. Btw, this shows is pretty hilarious sometimes. 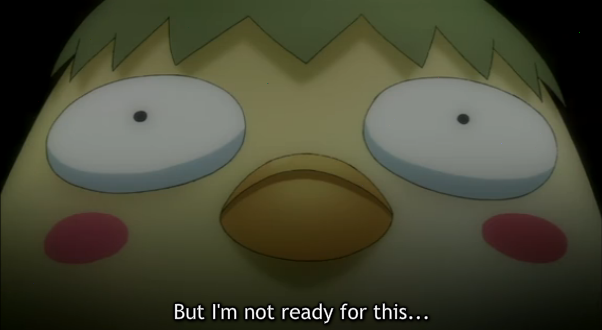 But i didn’t put high hope for this anime on my first trial… But it turns out to be an OK episode. Yes, they had a very different take on “zombie” than we usually see. It was also quite funny at times, as you say. I really wished I dropped this show early on. Other than the first few episodes…the whole thing was just really really pointless..
I’m also getting the same feeling with Gosick. Don’t know whether to drop or not considering the amount of shows airing this season..
Kujo is a very annoying guy.. There are a lot of good shows coming in Spring, so I don’t blame you. I’m hoping for some really solid shows, instead of shows that have some good qualities. Zombie had a few good episodes. I would try to encourage someone to see the better episodes, but much of it is, as you say, “pointless”, and not worth watching. I’ll probably give Gosick a couple more episodes to see how things pan out.. The thing I don’t get with Zombie was, why Yuu was so adverse to killing the bad guy. The guy just wanted to die..just let him. Oh yeah..good to see that you’ve gotten your computer back up and running. Just in time for the new season. She should have turned him into a penguin. That way he would be harmless.